Located in the heart of Mennonite country, At the Crossroads is located on Regional Road 85 between St. Jacobs and Elmira. Originally opened in the 1960’s as Seiling’s Cantine, the restaurant has undergone several transformations through the years. In 1996, At the Crossroads was purchased by current owner, Anton Heimpel. In 2002 an extensive renovation not only changed the building’s exterior, but also added a 3500 sq. ft. gift shop known as The Mercantile to the restaurant, making it not only a place to eat but also a local attraction. Also located on site is Quilter’s Nine Patch, offering supplies and lessons for quilters and rug hookers. Inside the restaurant, quilts and pictures of Mennonite lifestyle enhance the friendly atmosphere. 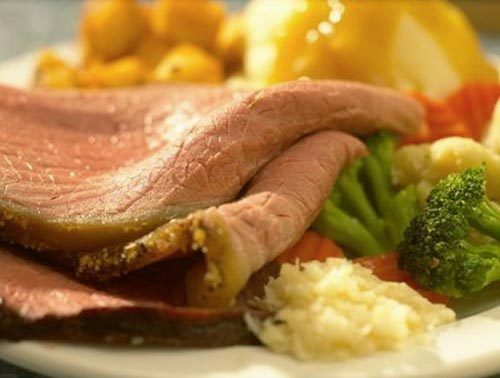 At the Crossroads Family Restaurant offers a full menu of traditional items, including roast turkey dinner, broasted chicken, hot beef sandwiches, and an all-day breakfast. However, their popular buffets are the best way to try a little bit of everything! Soups, salads, fresh homemade breads, hot buffet tables, and the all-you-can-eat dessert tables are all part of the buffets that keep people coming back to the restaurant over and over again. The restaurant seats about 340 people on one level. In addition to their main dining room, they also offer several rooms that can be rented for private functions. Located close to many local attractions such as the Cambridge Butterfly Conservatory, St Jacob’s Country Playhouse, and the St. Jacobs Farmers’ Market, At the Crossroads is a great place to bring the family after a busy day of exploring in Waterloo Region. At the Crossroads Family Restaurant – enjoy A Taste of Home When You’re Not. Proof Kitchen + Lounge offers a menu pairing local ingredients with global flavours. The contemporary industrial decor is the perfect atmosphere for dining. Enjoy the latest craft beer in the lounge, or relax on the 3-season patio.